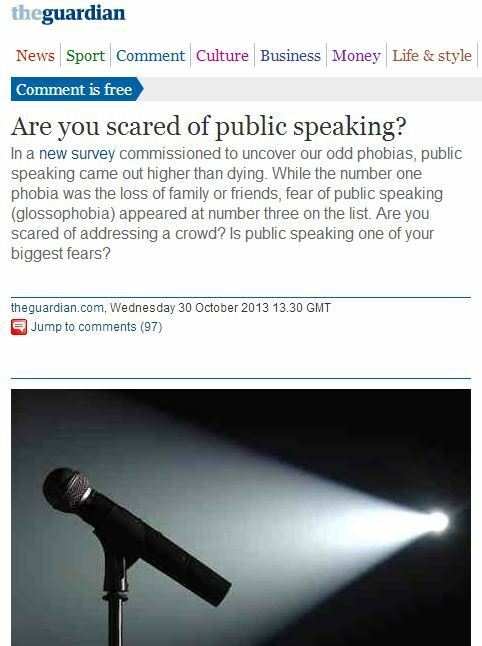 In a new survey commissioned to uncover our odd phobias, public speaking came out higher than dying. While the number one phobia was the loss of family or friends, fear of public speaking (glossophobia) appeared at number three on the list. Are you scared of addressing a crowd? Is public speaking one of your biggest fears? 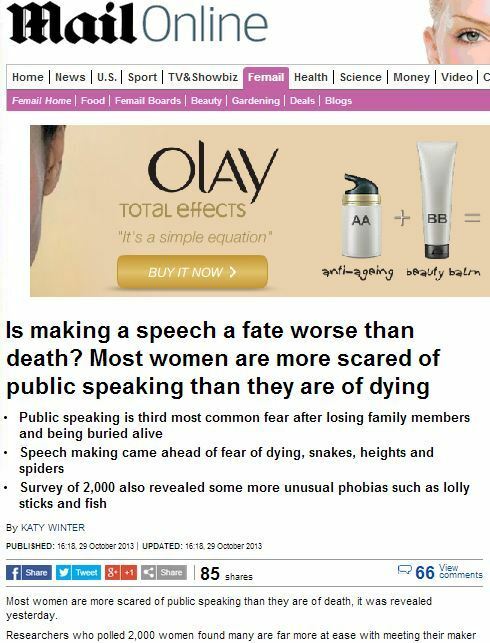 Most women are more scared of public speaking than they are of death, it was revealed yesterday. Researchers who polled 2,000 women found many are far more at ease with meeting their maker than they are of standing in a room talking to an audience hanging on their every word. The study found women loathe the thought of making a spectacle of themselves, and feel more nervous about stuttering, tripping up and looking foolish than going to an early grave. 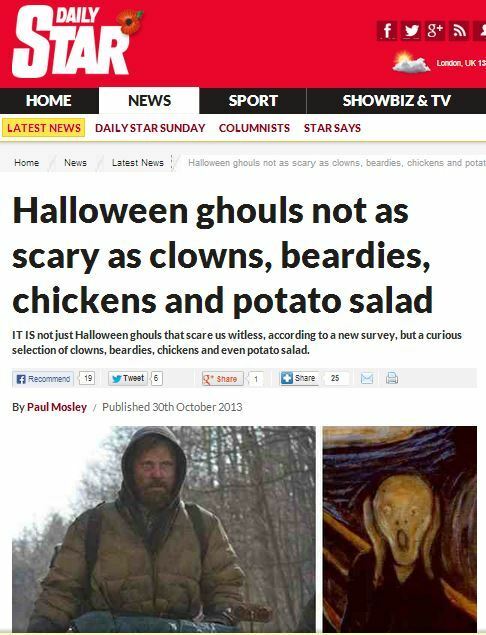 IT IS not just Halloween ghouls that scare us witless, according to a new survey, but a curious selection of clowns, beardies, chickens and even potato salad. There are a raft of recognised things that give us the screaming abdabs. Snakes, spiders, ghosts, rats, the boss, creepy crawlies and the bogeyman all give us nightmares. But top of the strangest phobias – or maybe not so strange –is the fear of being the last living soul on Earth, the theme of chilling movie The Road starring Viggo Mortensen. Other unexpected horrors are the telly breaking down and clowns. Bizarre, but true. The findings come from a survey commissioned by London visitor attraction Ripley’s Believe It or Not! Ah, true as in ‘meaningless PR intended to advertise a museum dedicated to scary and unusual things’, gotcha. “There are many common fears that a lot of us share but here at Ripley’s we celebrate all that is unusual across the globe… so delving into our more bizarre phobias was fascinating,” said Natascha Crump, general manager at Ripley’s Believe It or Not! London. “It is interesting to find out about people’s fears of nylon sheets, chickens and being the sole survivor of an apocalypse. From a sober debate on the pressures of public speaking, to pogonophobia and broken televisions – Ripley’s certainly managed to cut their cloth to suit all takers with this story. Equally, it’s rare and refreshing for PR stories to come with disbelief built right in as an option – I think I’ll choose not to believe this research, Ripley, thank you very much. This entry was posted in Uncategorized and tagged daily mail, daily star, guardian, katy winter, natascha crump, paul mosley, ripley's believe it or not on November 6, 2013 by Michael Marshall.